It has been shown recently that donor and/or recipient cytomegalovirus (CMV) seropositivity is associated with a significant overall survival (OS) decline in acute leukemia patients who underwent allogeneic hematopoietic stem cell transplantation (allo-HSCT). We now analyzed the prognostic impact of the donor/recipient CMV serostatus in 6968 patients with chronic hematological malignancies who underwent allo-HSCT. Donor and/or recipient CMV seropositivity was associated with a significantly reduced 2-year progression-free survival (PFS, 50% vs. 52%, p = 0.03) and OS (62% vs. 65%, p = 0.01). Multivariate Cox regression analyses showed an independent negative prognostic impact of donor and/or recipient CMV seropositivity on PFS (HR, 1.1; 95% CI, 1.0–1.2; p = 0.03), OS (HR, 1.1; 95% CI, 1.0–1.2; p = 0.003), and non-relapse mortality (HR, 1.2; 95% CI, 1.0–1.3; p = 0.02). OS decline was strongest for CMV-seropositive recipients with a CMV-seronegative donor (HR, 1.2; 95% CI, 1.1–1.3), followed by CMV-seropositive patients with a CMV-seropositive donor (HR, 1.1; 95% CI, 1.0–1.2). Conversely, OS did not differ significantly between CMV-seronegative recipients allografted from a CMV-seropositive donor (HR, 1.0; 95% CI, 0.9–1.2) and patients with donor/recipient CMV seronegativity (p = 0.001 for the four groups together). Non-relapse mortality was also significantly (p = 0.01) higher for CMV-seropositive patients with a CMV-seronegative graft (HR, 1.2; 95% CI, 1.1–1.4) than for CMV-seropositive patients with a CMV-seropositive graft (HR, 1.1; 95% CI, 0.9–1.2) or CMV-seronegative recipients with a CMV-seropositive graft (HR, 1.0; 95% CI, 0.8–1.2). 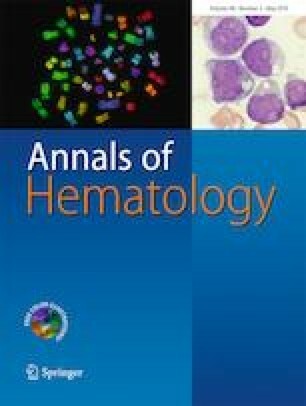 Donor and/or recipient CMV seropositivity still results in an OS decline in patients with chronic hematological malignancies who have undergone allo-HSCT. However, this OS decline seems to be lower than that described for acute leukemia patients previously. Part of the data have been presented at the annual meeting of the American Society of Hematology 2017 (Atlanta, USA). The online version of this article ( https://doi.org/10.1007/s00277-019-03669-z) contains supplementary material, which is available to authorized users. M.S.H., G.T., P.L., M.Mik., and J.S. designed the research. M.S.H., G.T., P.L., M.Mik., N.K., D.B., G.S., L.V., N.B., N.F., I.Y.A., E.F., J.M, P.C., J.P., J.C., N.R., C.C., J.H.B., T.M., P.R., J.Y.C., M.Mic., S.M., N.K., B.G., and J.S. provided important clinical data and/or performed statistical analyses. M.S.H. wrote the first draft of the manuscript. All authors approved the final version of the manuscript. A complete list of contributors appears in the online data supplement. The authors thank all allogeneic transplantation centers of the European Bone Marrow Transplantation group for reporting the data to this registry. I.Y.A received honorarium from Biotest and MSD Sharp & Dohme GmbH that commercialize anti-CMV drugs. The other authors declare that they have no conflicts of interest. According to EBMT policy, patients give informed consent for data reporting to the EBMT registry.